My last day of school was May 22, so this weekend kicked off my three-month long summer break. Boo. Yah. These past three days were a great mix of music, drinks, friends, sunshine, relaxation, & food. So Much Food...fish tacos at Broadway Oyster Bar, shrimp boil at a friend's new apartment, and a BBQ at my boyfriend's house that offered 5 different meats...local burgers/brats/hot dogs, our own smoked sausage, and homemade bacon jam. Let me tell you about that smoked sausage. Last weekend, I went over to Corey's house for dinner. "Whatcha doing?" I asked when I showed up. "Smoking a fatty," he replied. "Come here and look at my sausage," he insisted. I followed him to the backyard, skeptical of what I would find out there, not expecting to see an entire roll of breakfast sausage (unwrapped, of course) being smoked on the grill. I was Leery. Concerned. Intrigued. After a 2-hour slow cook over some applewood chips, Corey's sausage was damn delicious. Hubba. Anyway...try this sausage. Then chill it and slice it like summer sausage. You won't be sorry. TRUST ME. 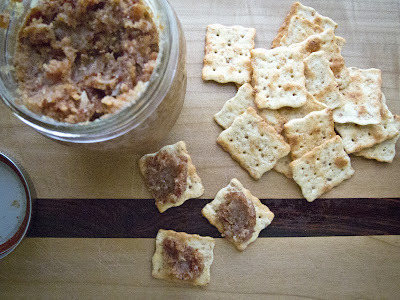 And then, make some bacon jam. It will be a hit. I promise. It was definitely a big hit at our BBQ yesterday. Serve it with crackers. Smear some on a burger. Try it for breakfast on toast with a fried egg. Keep a jar on the nightstand next to the bed. WHATEVER YOU WANT. I won't judge. * I didn't add the red pepper flakes either time I made this recipe, but each time I thought that the sweet jam needed just a hint of spice. So, I will add them next time. Cook the bacon pieces in a large stockpot, frying pan, or Dutch oven until browned. Transfer to a paper towel-lined bowl, reserving 3 tablespoons of the bacon fat in the pan. Add the onions and garlic to the pan & sauté in the reserved bacon fat for 8 to 10 minutes. Add the vinegar, maple syrup, brown sugar, coffee, black pepper & red pepper flakes and reduce heat to low. Allow the mixture to come to a boil, then return to medium-high heat & boil hard for 2 to 3 minutes. Add the bacon back into the mixture. Reduce heat to low and simmer, stirring, for 8 to 10 minutes. Remove from heat. Pulse the mixture in a food processor until it reaches a spreadable consistency. Serve warm, at room temperature, or cold. Refrigerate for up to 2 weeks.